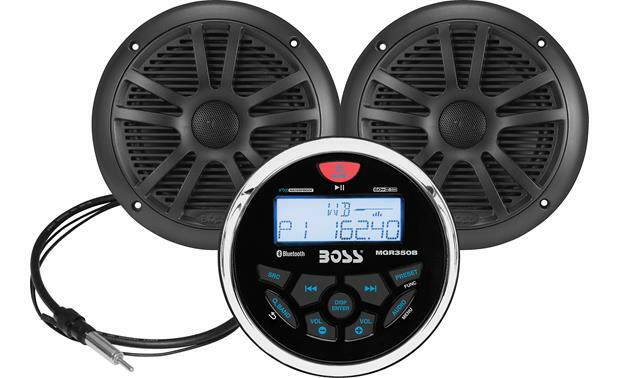 This receiver/speaker combo package from Boss is a great way to upgrade the audio on your boat or ATV without emptying your wallet. The all-weather digital media receiver features built-in Bluetooth, so you can stream your favorite tunes without taking your phone out of your pocket. And your music will sound great on the 6-1/2" marine-rated speakers. 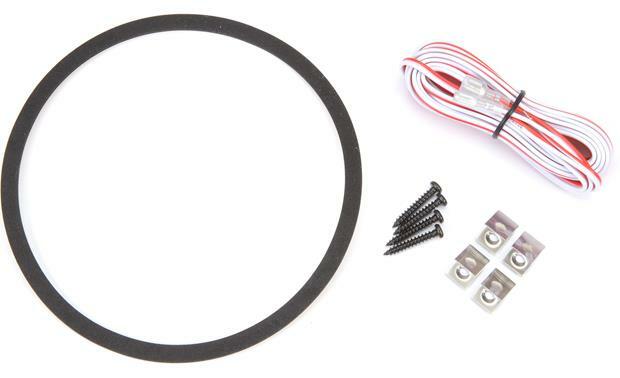 This package also includes a 41" dipole antenna and mounting hardware. The Boss MGR350B digital media receiver packs a lot of features into a compact design that fits into a standard gauge opening. 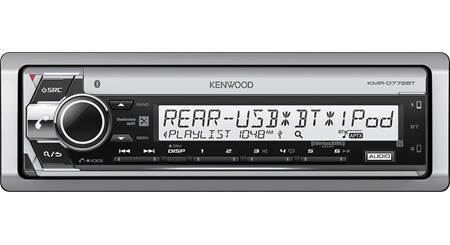 Crank up some AM/FM radio, or plug a compatible device into the rear USB or AUX inputs. And if you need to know what Mother Nature's planning for later, tune in to the Weather Band. The backlit LED display lets you see what you're hearing with just a glance, while the IPX6-rated water-resistant face panel and controls are made to resist sun, salt, and moisture. 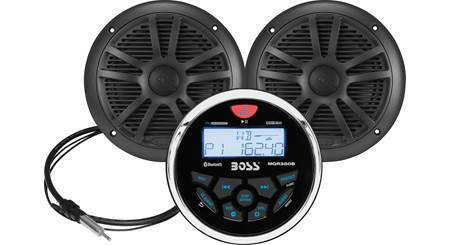 The Boss MR6 marine speakers pair up perfectly with this receiver. These durable 6-1/2" dual cone speakers provide plenty of low-end punch and good clarity, with a water-resistant design that stands up to outdoor use without sacrificing style. Can this be easily installed for a golf cart as well? This form factor might be easier to use on a golf cart where a standard single-DIN radio may not fit. Great radio installations are simple. IPX6 Certified: The Boss Marine gauge-style receiver has been engineered and tested for use in the harsh marine environment. The marine digital media receiver features UV coating and PC board with conformal coating to prevent fading and protect against corrosion. It also features IPX6 waterproof certification, so it can hold up in the marine environment and withstand powerful splashes of water out on the ocean or lake. During testing, water is projected at all angles through a 12.5mm nozzle at a flow rate of 100 liters/min at a pressure of 100 kN/m2 for 3 minutes from a distance of 3 meters. Note: This unit should not be submerged in water. 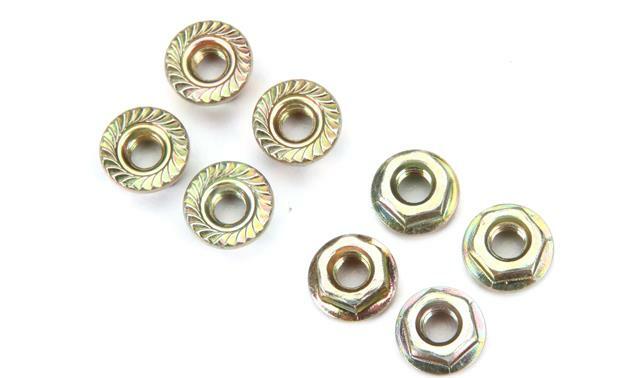 Note: The receiver is round and does not include a mounting sleeve or ISO-mount screw holes to accommodate standard automotive installation. Bluetooth Audio Streaming: Thanks to built-in Bluetooth 3.0, you can wirelessly stream stored music and music apps from your Bluetooth-enabled Apple iPod/iPhone/iPad, Android smartphone/tablet, or other Bluetooth source device to the Boss Marine gauge-style receiver. The unit offers Play/Pause & Previous/Next Track control (there is no song/artist info display). Note: This unit does not offer support for Bluetooth hands-free phone communication. 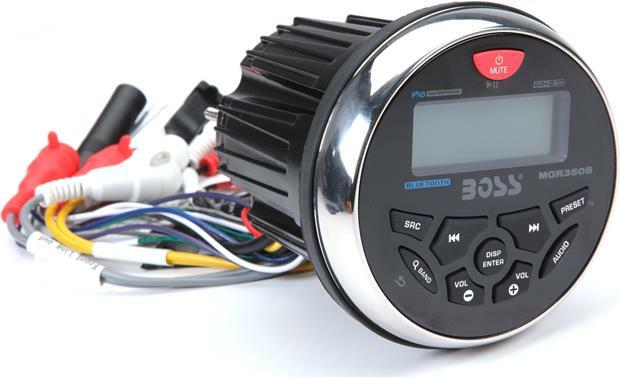 USB-A Port: The Boss Marine gauge-style receiver is fitted with a rear-panel USB-A port attached to the rear-chassis via a 7" cable. The USB-A port allows you to plug in your USB mass storage class device, like a USB thumbdrive or portable digital audio player (up to 32GB) for playback of MP3/WMA music files (up to 65,000 songs). Your USB MSC device must be formatted in FAT 32. The unit offers Play/Pause & Previous/Next Track control (there is no song/artist info display). If your USB MSC device can be charged via USB, the unit's USB (5V/1A) port will charge your device while connected. Note: The unit's USB port does not support Apple iPod/iPod/iPad, Android smartphones/tablets, HDDs, or USB hubs. Aux Input: The Boss Marine gauge-style receiver is equipped with a rear-panel stereo RCA Aux input attached to rear-chassis via a 7" cable. The stereo RCA aux input allows you to connect an external audio device with a stereo RCA output. 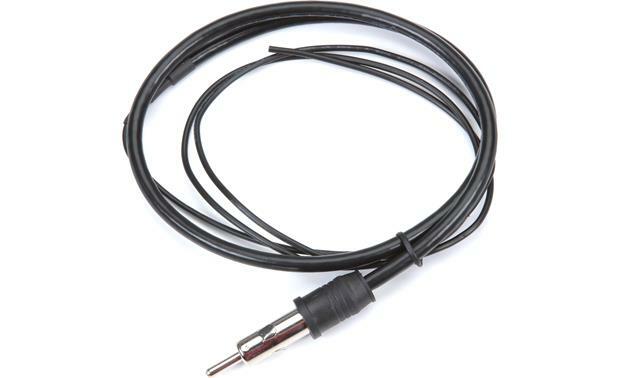 If you have a source device that has a 3.5mm output, then you will need a stereo RCA-to-minijack adapter (sold separately). 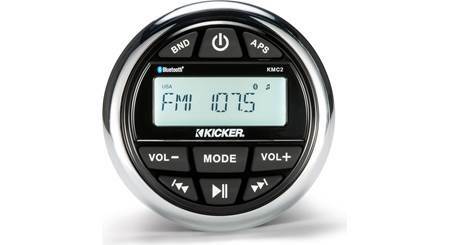 AM/FM + Weather Band Tuner: The Boss Marine gauge-style receiver features a built-in AM/FM tuner with RDS, plus a 7-channel NOAA weather band tuner. 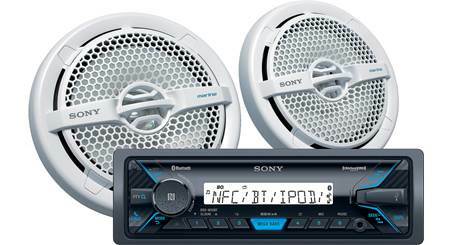 You can store up to 12 FM and 6 AM preset stations. You can also select between US or European tuning. The Radio Data System (RDS) feature displays radio broadcast information, such as artist & track information when listening to compatible AM/FM stations. Note: A 41" marine dipole antenna is included. 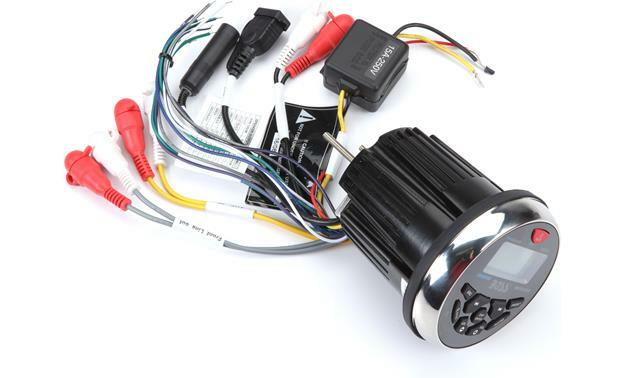 MOSFET Amplifier: The Boss Marine gauge-style receiver is equipped with a MOSFET amplifier rated at 20W (RMS) x 4 channel / 60W (Peak) x 4 channel. 2V/4Ch Pre-Outs + Sub Control: The marine digital media receiver is fitted with a 2-volt front pre-out and a 2-volt rear/sub pre-out. When set to sub pre-out, you can adjust the sub's low-pass crossover (80/120/160Hz) and sub level control (0-12). EQ: The marine digital media receiver offers 8 EQ Presets - Flat, Jazz, Pop, Classical, Rock, Techno, Vocal, and User. The User mode allows you to manually adjust the unit's Bass, Mid, and Treble. There is also an XBass (Bass Boost) feature that can be turned on or off. LCD Screen: The Boss Marine gauge-style receiver features a front-panel LCD screen with bluish white illumination. The LCD screen indicates source input, AM/FM station number, and menu settings. This unit does not provide song/artist information. 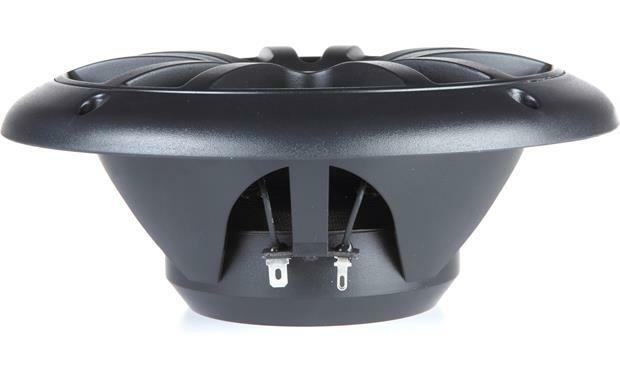 Marine Dual Cone Speakers: The Boss MR6B speakers are designed and treated for use in the harsh marine environment. 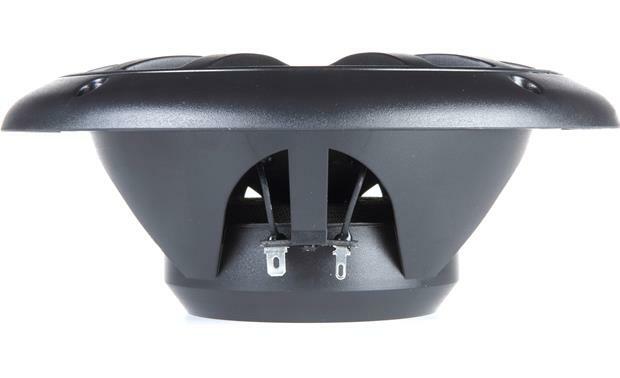 The marine dual cone speakers feature a cone woofer and cone tweeter. 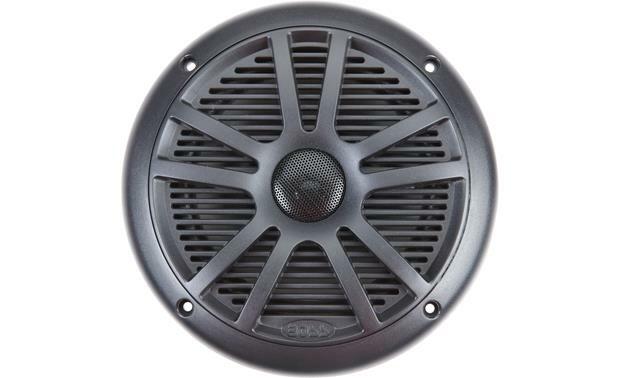 The speaker has a frequency response of 80Hz-20kHz and can handle up to 180-watts (max). UV Resistant Basket & Grille: The integrated basket and grille are made of durable UV resistant plastic. Included Hardware: The speakers include stainless steel mounting screws and self-adhesive foam gaskets for a watertight fit. The spaekers actually fit in a 5.5" cutout. a 6" cutout would be too large making the supplied speaker gasket unable to prevent moisture from getting behind the speaker. The speakers come packaged with a piece of cardboard with the correct size hole for the cutout. You can use this as a template to make your hole the perfect size. Why did someone say that the speakers require a 6.1" cutout? Can I connect a subwoofer and amp to this unit? You do have subwoofer rear and front line out connectors. Also aux in right and left and a 12V app remote out. Per wiring diagram. I would say yes. Yet I was impressed with the sound from 2-6-1/2 " speakers. 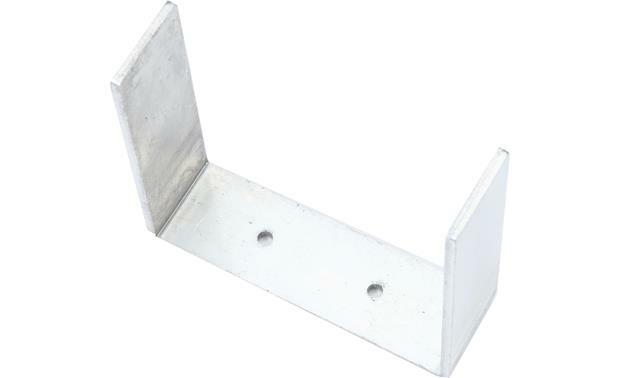 Check the hole dimensions and the mounting depth. I put it in a boat, it went in easy. Yes, that's exactly what I utilized and ran it to the single Boss bar speaker. will the receiver be ok exposed in the rain? Will you be getting more of the white speakers in anytime soon? I'm afraid we're still waiting on Boss to provide us with an ETA for the Marine Receiver/Speakers Package (with white speakers). However you can reserve one risk free from our website; or sign up to receive the latest ETA alerts via email. For more details or to discuss further, please contact an Advisor directly by phone (888.955.6000) or online chat. Thanks! Can I ad 2 more speakers to this set up? Will a 6" diameter hole work for speakers? Also pls confirm depth needed. What diameter and how deep is the receiver? I can't find that in the specs. 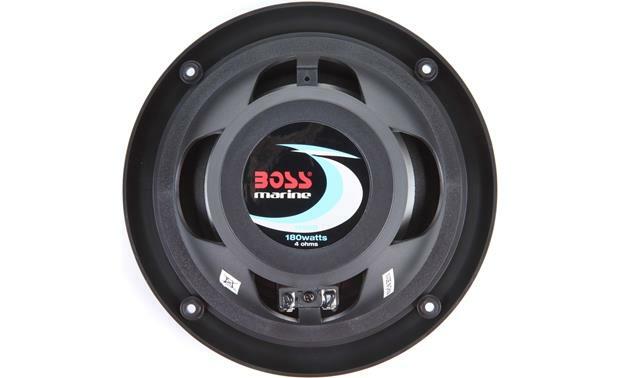 The dimensions of the Boss Marine digital media receiver are as follows - Chassis & Cutout: 3" (diameter) x 4.3125" (depth) Front-Panel: 3.625" (diameter) x 0.8125" (depth) This information and more can be found under the "Details" tab of the product page on our website. If you would like to discuss further feel free to contact an Advisor directly by phone (1-800-324-9695) or online chat. Searches related to the Boss MCKGB350B.6 Marine audio package: Includes MGR350B digital media receiver and MR6 marine speakers.